Three of my best-selling products are now being offered in this bundle, saving you 20% off the price of these products if purchased separately. Please make sure you have the ability to unzip files before purchasing. 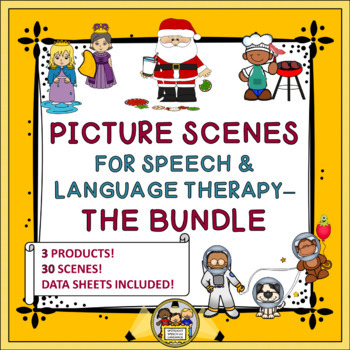 Each product includes ten picture scenes and a double-sided data sheet which corresponds to each scene - 30 picture scenes in all! Data can be collected for up to five students on each data sheet. Targeted skills include vocabulary recognition, labeling, answering WH questions, sentence formulation, comparing/contrasting, giving directions, and defining/describing. Picture scenes can be presented on a tablet or computer (I use iBooks on the iPad). I hope you enjoy these no prep activities! Follow my store to be notified re: new products and sales!